My sister Darby and I have been on the search for reputable and knowledgable all-natural apothecaries run by women. We landed on one just to discover some unsavory bits after digging around in reviews. I kept searching and somehow The Coal Miner's Daughter came across my awareness. She happened to be having a sale but the code wasn't working for me. I sent over a message and a few days later she responded with an apology and a working code. She also sent along a crystal as a thank you for the delay of response. There were a few things that I wanted to try from teas to balms and perfumes but I ended up drifting to the mists. These can be used as toners, pillow sprays, room sprays, body sprays or pretty much anything. Love by the Moon Surrounding Mist contains organic rose water, patchouli, jasmine, vanilla and lavender essential oils ($18). This is mostly for a bedtime routine as it promotes a better night's sleep. This does need to be shaken well before use as the oils separate from the rose water. I enjoy spraying this on my arms, neck and chest before bed. The oils combine to create a citrusy toned lavender and patchouli blend. There is a subtle coolness to it so I want to say there might even be a mint or something lurking about. I love the scent and it is a nice addition to my bedtime routine. 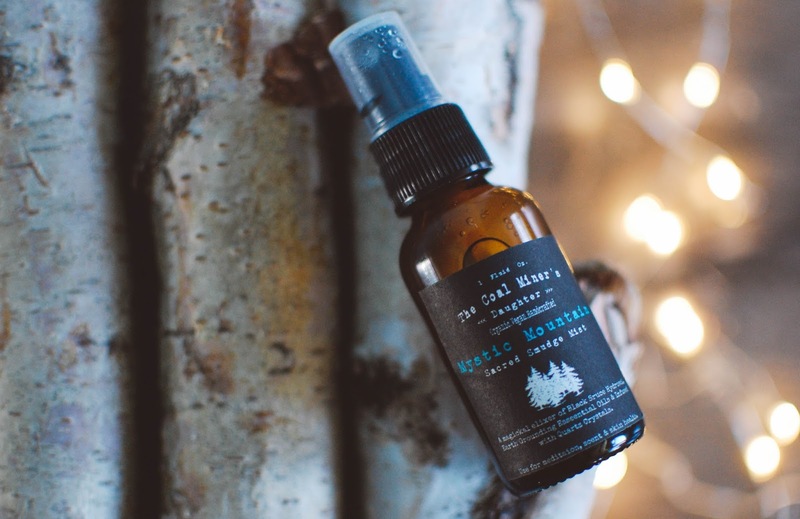 Mystic Mountain Sacred Smudge Mist is ethically wild harvested and contains black spruce hydrosol, pine and vetiver and was infused with quartz crystal ($24). Mystic Mountain can be utilized as a room mist or a skin and face toner. The solution requires shaking before use. I prefer spraying this on my face as a refreshing toner before bed or if I am going naked faced for the day. It smells smoky and earthy with a touch of dank forest floor. The ingredient list on the website doesn't state sage, and the label is a bit vague in stating there are "essential oils" but I would assume (and hope?) sage is in there somewhere. I do like how it feels on the skin. These bottles are one ounce each, so they won't have a terribly long life span with frequent use. 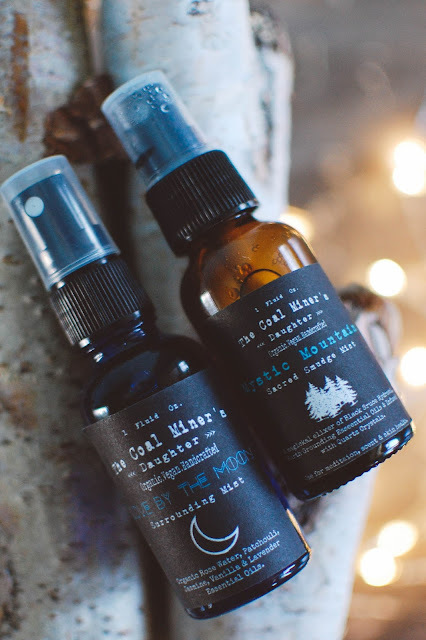 I love the handmade nature and the aroma of these two mists and will happily use them up. 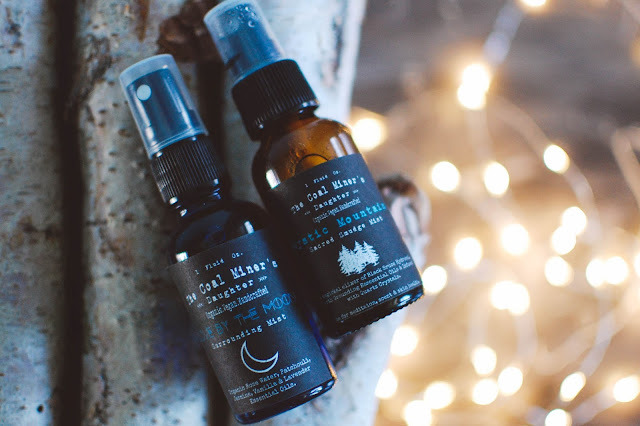 Do you have any natural apothecary type places you enjoy purchasing from? I am in the market for womb balms and whatnot. You know... self care for the lady bits.